We take a look at 13 compact basins specifically designed for cloakrooms and small ensuites to help you get the best style, functionality and value! Posted By Alan, 9th May 2018. 7 Minute Read. Whether you’re designing a new cloakroom for additional practicality or you’ve decided to update and refresh your old cloakroom, one thing you’ll need is a cloakroom basin. A cloakroom suite will typically consist of a lot less items than a bathroom which is great as they don’t cost the earth, but they’re typically compact spaces so it’s important that you choose space-saving items to help maximise comfort. That’s where cloakroom basins come in. 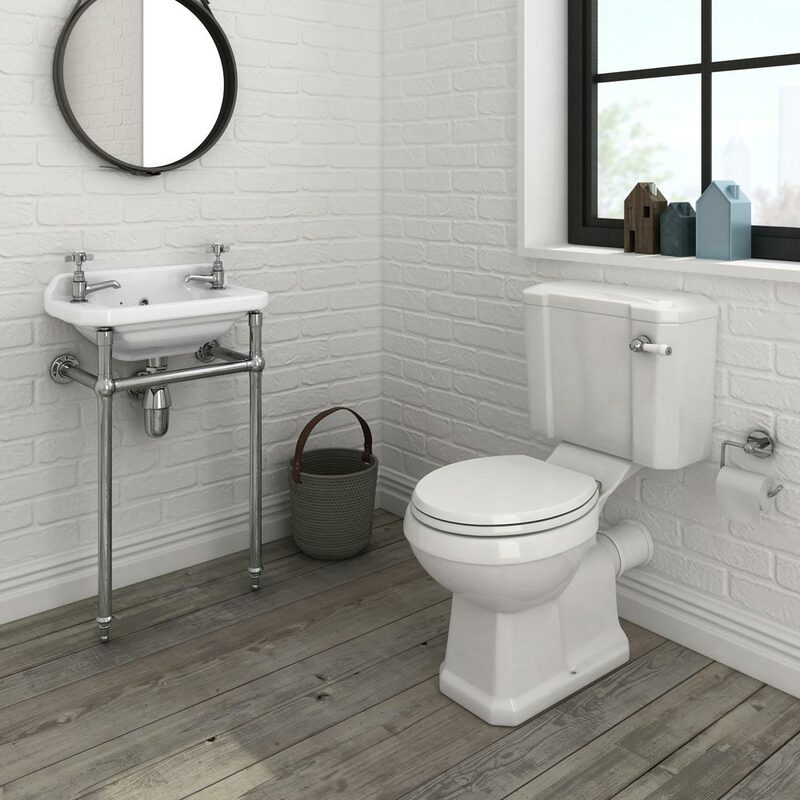 To help you create the most stylish cloakroom in your home the experts here at Victorian Plumbing have picked out 13 cloakroom basins which offer something special be it design, functionality, quality or value. 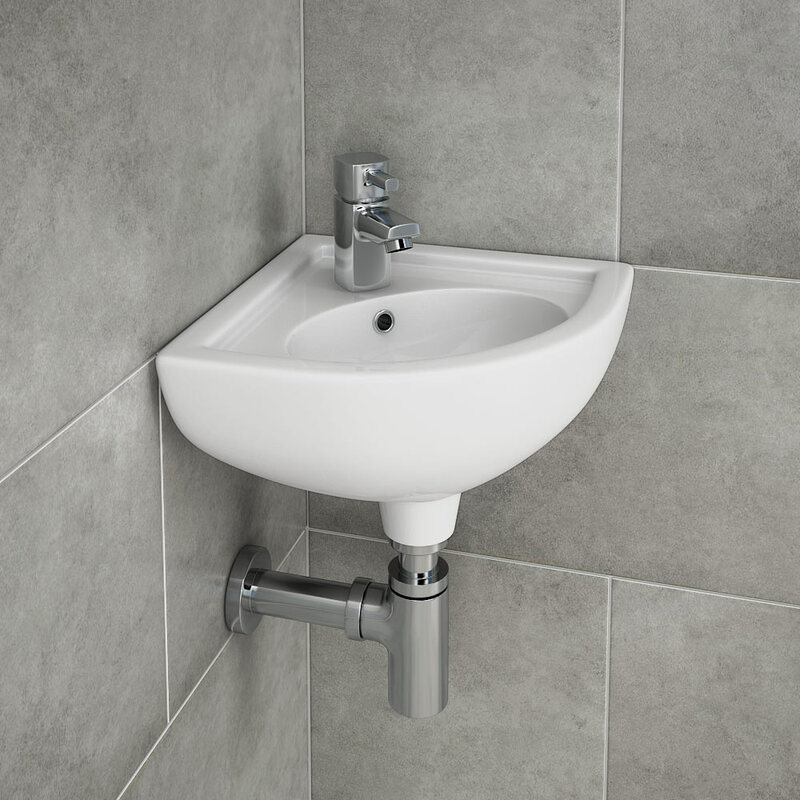 We want to help you make a small cloakroom feel bigger by utilising compact basins which are specially designed for cloakrooms, small cloakrooms and ensuites. 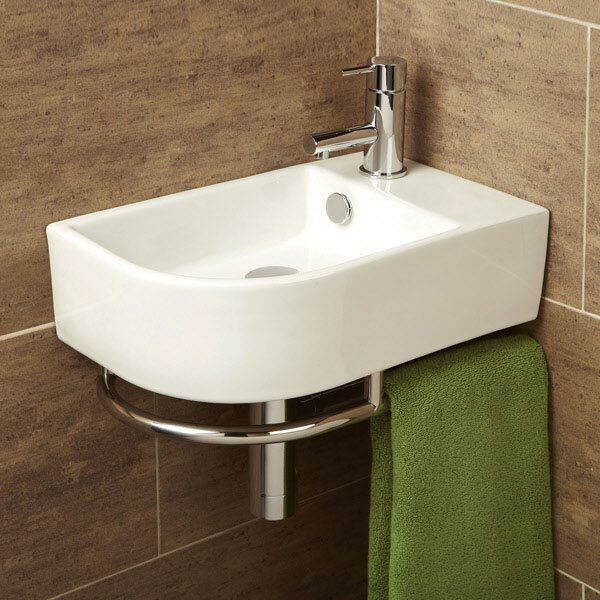 For a neat little modern cloakroom you may want to consider a compact, rectangular-shaped, wall hung cloakroom basin. 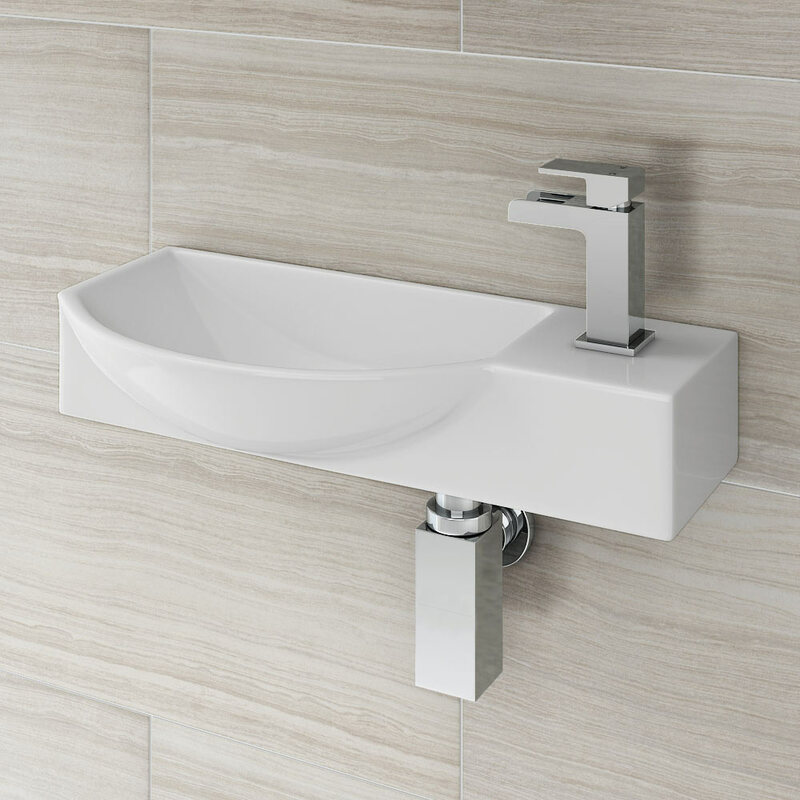 The rectangular shape of the Rondo cloakroom basin above gives you ample handwashing space, yet it’s narrow design (just 180mm deep) doesn’t take up too much space. Being wall hung opens up the space around it and keeps the cloakroom looking as spacious as possible. 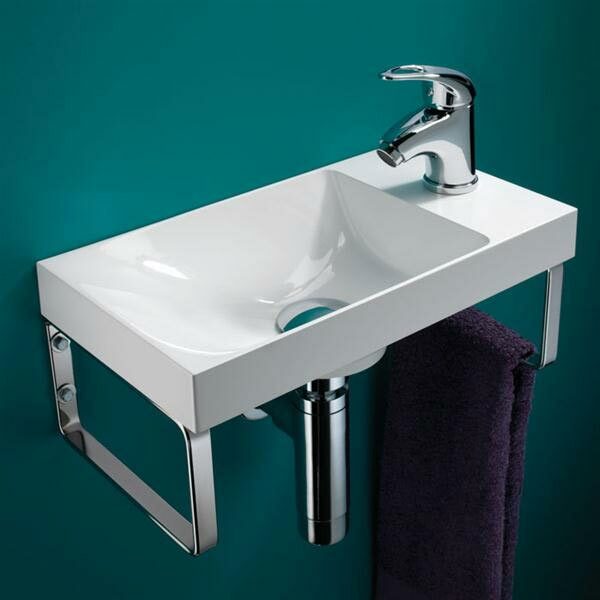 For the ultimate in space-saving cloakroom basins why not consider a contemporary wall hung corner style basin? Tucking your basin away in the corner, as you would with the RAK corner cloakroom basin, will help use up that area in your cloakroom and free up space elsewhere. And with all RAK products you know you’re getting excellent quality and style! If you’re looking for a stylish modern cloakroom basin which still features a compact design then go for a rectangular wall hung basin with a twist. Unlike the Ronda basin mentioned earlier which features a simple design, the Valencia mini wall hung cloakroom basin features a round design which gives plenty of room to wash your hands and is incredible value for money. Add tons of style to your cloakroom with a square wall hung cloakroom basin. 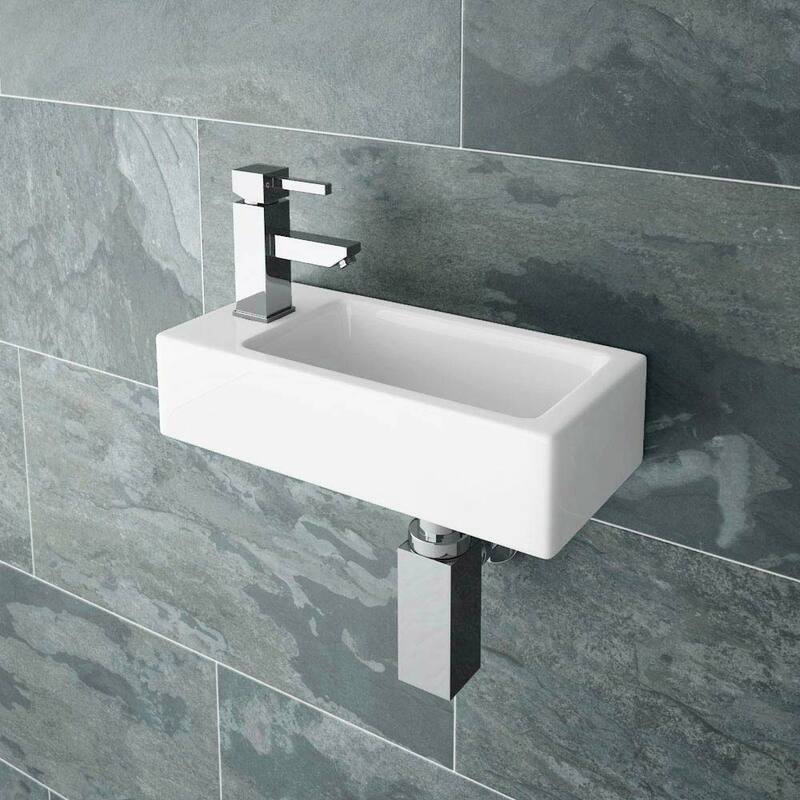 The stunning contemporary cube design of the aptly named Cubetto wall hung cloakroom basin may have a larger depth, but it’s reduced width uses less wall space. The added depth ensures there’s plenty of room to wash hands and the beautiful bold style makes it very pleasing on the eye! For a luxurious traditional cloakroom you may want to look at Edwardian style wall hung cloakroom basins. This stunning Edwardian wall mounted cloakroom basin from Burlington features exceptional design and quality. Made using Vitreous china, this compact wall hung basin features 2 tap holes which are perfect for adding a pair of authentic traditional basin taps. It also features a beautiful chrome towel rail below for additional practicality. Looking for something different like a black cloakroom basin? 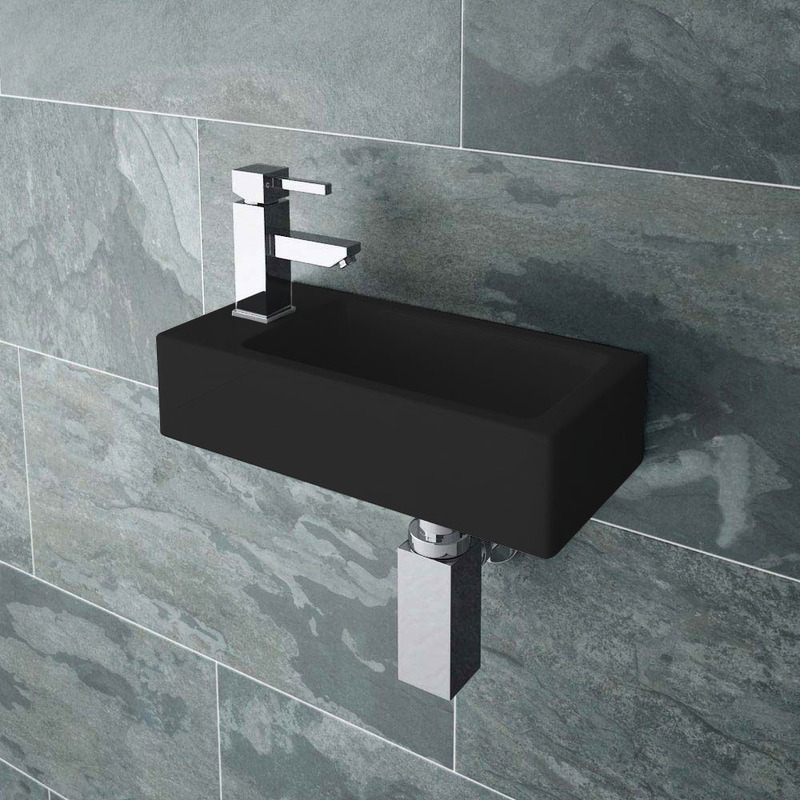 This Rondo black wall hung cloakroom basin is a really unique idea which will work really well with a variety of cloakroom designs. There’s lots of room to wash hands and it’s also excellent value for money. 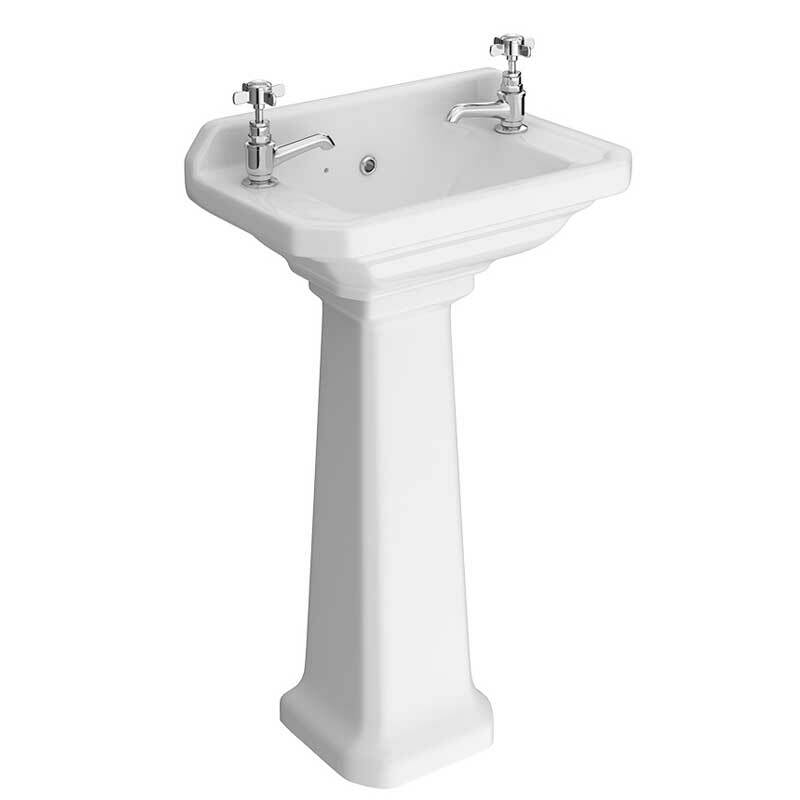 A traditional cloakroom suite will certainly appreciate a full pedestal style cloakroom basin to give it a period look. This beautifully compact Carlton cloakroom basin with full pedestal is the perfect option for traditional cloakrooms. Manufactured to high standards using high quality Vitreous china it works out to be amazing value. Minimalist cloakrooms will want to keep things simple yet stunning and many modern square basins carry these traits. 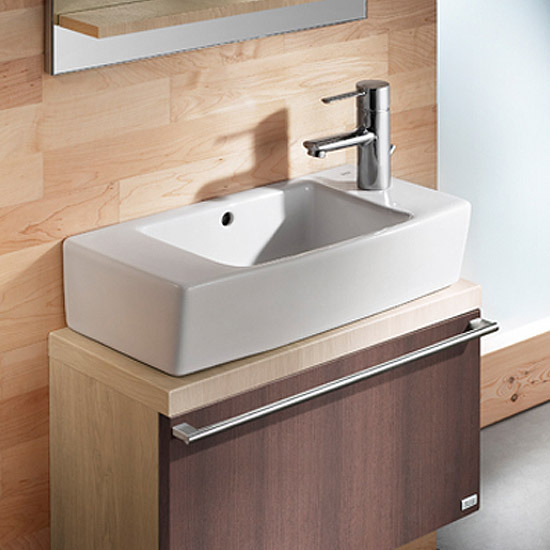 Nothing quite says minimalism like this compact RAK Summit square hand basin sink. With it’s low projection of just 310mm it’s perfect for small cloakrooms and it’s super-stylish and will cost a lot less than you’d expect. When creating a truly authentic traditional cloakroom design you’ll really want to be hunting for a cloakroom basin with a chrome wash stand. It may not be the smallest cloakroom basin, but if you do have a little more space than usual then we’re positive you’ll be considering something like this Keswick traditional cloakroom basin with a chrome wash stand. Not only does it look fantastic, but it’s made to the highest standards and offers lots of practicality including somewhere to store your hand towels. 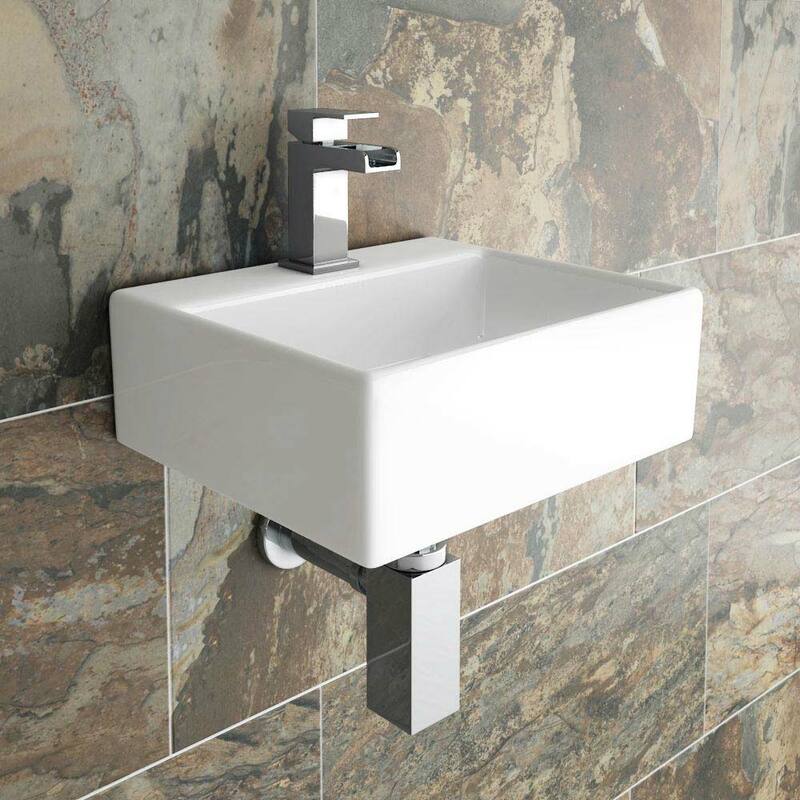 Rectangular cloakroom basins are highly popular and it isn’t difficult to see why, but instead of choosing a ceramic material why not consider mineral marble. HiB have manufactured a wide range of cloakroom basins from mineral marble rather than ceramic or porcelain. This excellent material is warmer to the touch, incredibly durable and most importantly - easy to clean. It makes the HiB Ocean mineral marble washbasin perfect for your cloakroom. Looking for a modern cube-shaped cloakroom basin with a full pedestal which will look fab in your home? 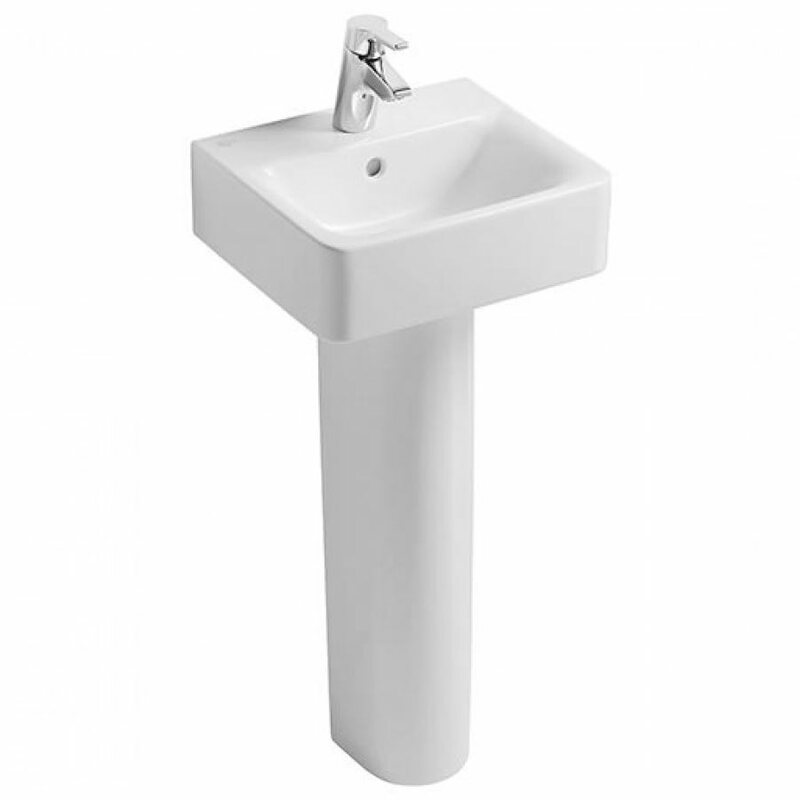 With this Ideal Standard concept cube handrinse basin you get a full pedestal included. 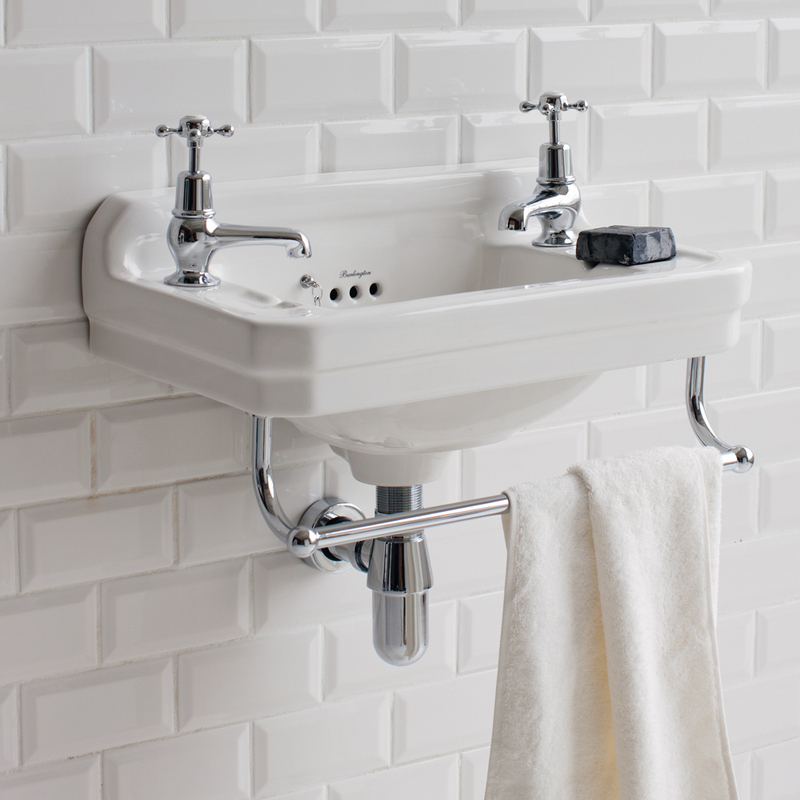 It’s perfect for any modern cloakroom and is made using high quality fine fireclay. This makes it extremely durable and the compact design will sit neatly in cloakroom saving you tons of space. If you’re looking for a modern cloakroom basin with a difference then why not go for a J-shaped corner basin. The unique and stunning design of the HiB Temoli cloakroom washbasin comes with a chrome towel rail for additional functionality. The wall hung style and short projection totally maximises the space in a small, modern space such as a cloakroom or ensuite. A wall hung cloakroom basin can also be used with a vanity unit below should you require a storage option in your cloakroom. An excellent choice for obtaining this look would be the Roca Hall wall hung cloakroom basin. It has a stylish look and compact size (just 250mm depth) which is great for space-saving and it’s made using Vitreous china - which makes it strong and durable. After looking through these cloakroom basin ideas we’re sure you’ll have seen something that you like. Picking the right cloakroom basin is important when you’re you’re short on space but there’s lots of other things to consider as well. The best place to start is with your budget. As you’ve seen there are many basins which you can choose which are excellent value. Always set yourself a budget and aim to find something which is affordable for you. Why not take a look at our favourite cloakroom basins under £50 for ideas? The next priority is size. All of the options we’ve looked at in this guide are great space-savers but some are smaller than others so check the dimensions and ensure you get something which won’t take up too much room. Materials used and functionality fall under style options and really tend to be options to consider once price and size has been considered. Materials used may affect the quality of the item and functionality is generally a bonus should your basin have it but it isn’t a necessity. Although a cloakroom basin will be a big feature in your cloakroom, you’ll also need a cloakroom toilet and cloakroom taps. Cloakroom toilets have a shorter projection and are compact in size to ensure that they’re excellent space-saving fixtures. 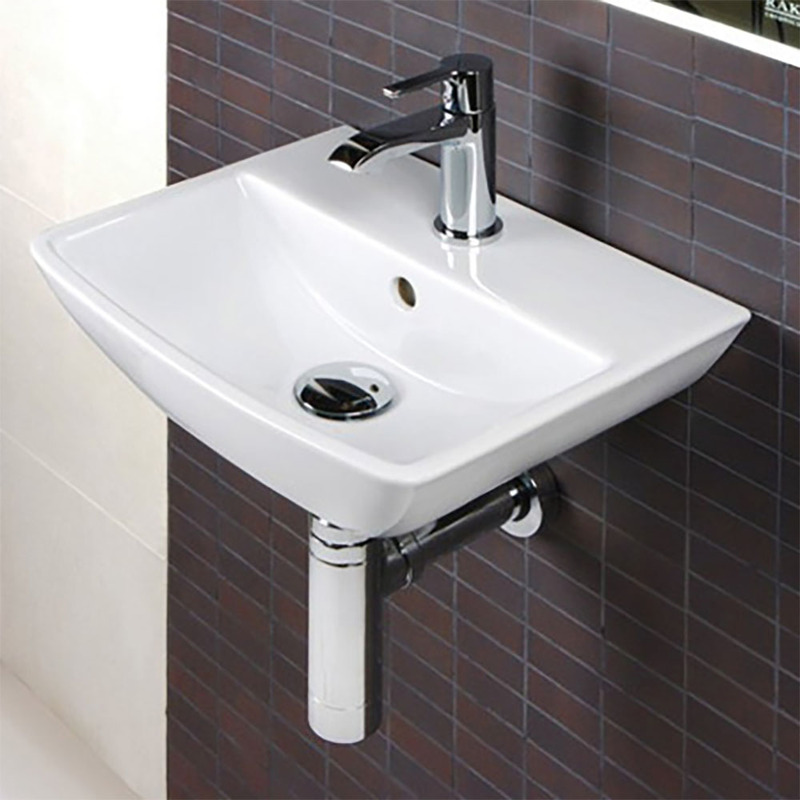 Cloakroom taps are also compact and are usually smaller versions than other taps you can get for your bathroom. This is because a cloakroom basin is smaller than a normal bathroom sink and a normal basin tap would look out of place. We hope you’ve found these cloakroom basin ideas helpful and as always if you’ve found this helpful then please share it with someone who you think will find it helpful too!